An open floor plan, a blending of modern appearance and natural elements, and non-traditional lines and curve of the walls and ceilings, define the ultra-chic ambiance of these inner-city apartments. 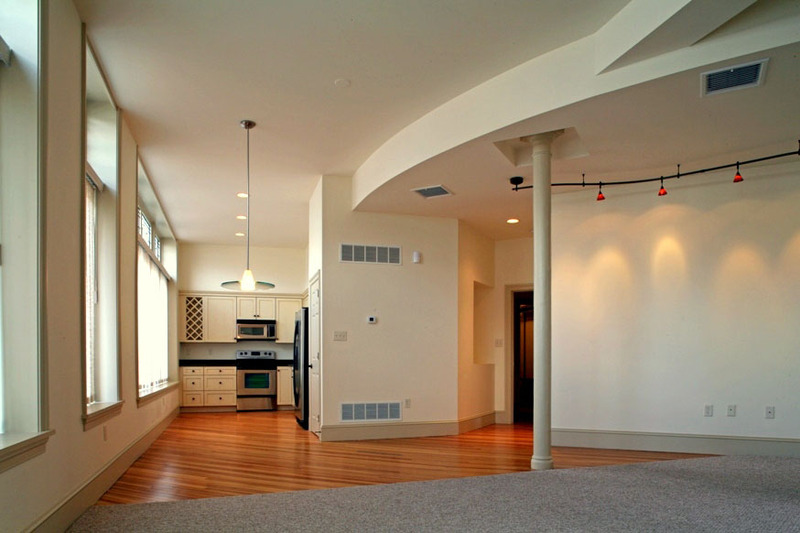 Converting old un-used buildings into income-generating rental units requires innovative architectural and design ideas that keep costs down for the investor/owner while creating a living environment that appeals to upscale renters. The combination of architectural style with practical function is seen throughout. 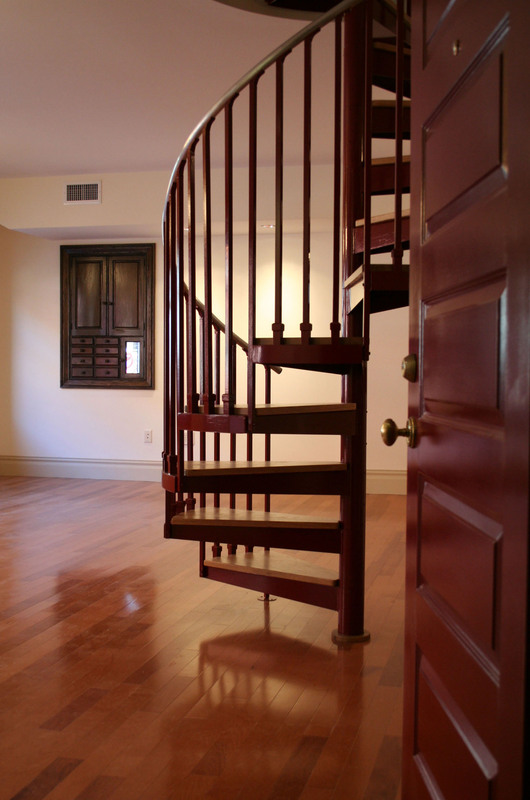 The elegant wooden spiral staircase is both an architectural focal point and a practical necessity, positioned in the room to give the renters lots of options for furniture arrangements and utilization of the space. 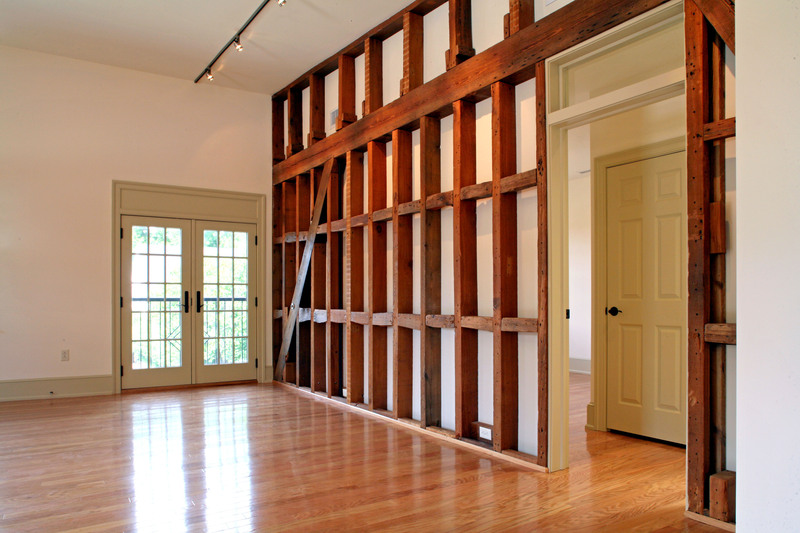 A built-in wooden cabinet with raised panel doors reflects the historic character of the building, while also being a practical storage area. Artistic appeal is apparent throughout this apartment with features like French doors, exposed framed members of the interior wall, and the glass transom on the interior door. Track lighting with movable lamp positions helps to highlight the fabulous display area for collectibles, artifacts, and books placed on the interior wall. Many of the original architectural features have been restored and preserved to retain the elegance of this grand building now transformed into apartment living. 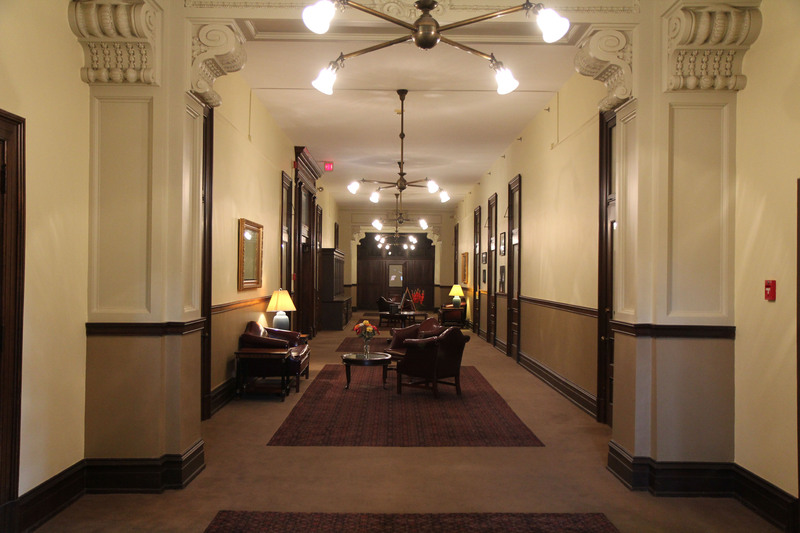 New lighting features are reminiscent of the period décor. Soft neutral paint colors enhance the dark richness of the wood trim and doors. Neutral colored carpeting, topped with rich elegant area rugs, soften the noise potential allowing tenants to come and go quietly without disturbing their neighbors. The kitchen in this apartment is actually encased within the open living space through the use of interior walls painted in a deeper contrasting color on the open side. 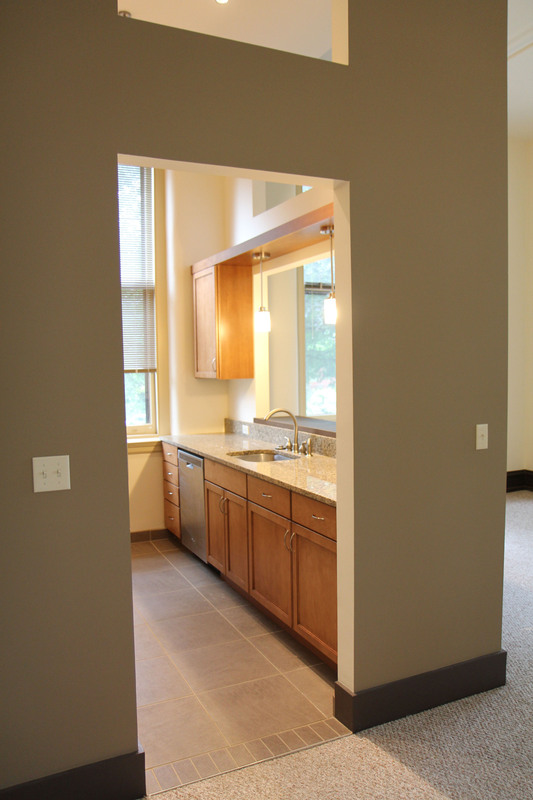 An open wall above the kitchen sink provides a serving area into the great room for social occasions and entertaining, and doubles as additional kitchen countertop space for food preparation. This kitchen, in a different apartment, is totally open and integrated with the living space. Dark wood cabinetry, black countertops, and stainless steel appliances create a bold contrast to the warmer wood tones in the floor and the lighter walls and trim. 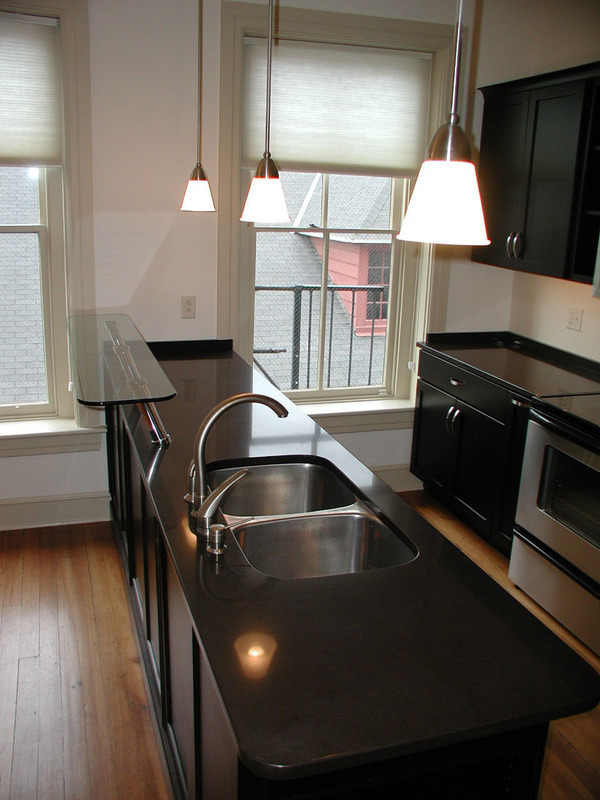 This design also allows for easy entertaining by using the kitchen surfaces as serving areas.